There are many sizes and types of waterways in this country from the traditionally sized narrow canal network able to take vessels carrying 25 tonnes to the largest ship canals and tidal estuaries. Below are some case studies of current operations on the smaller waterways of the UK. These can be viewed online or downloaded. 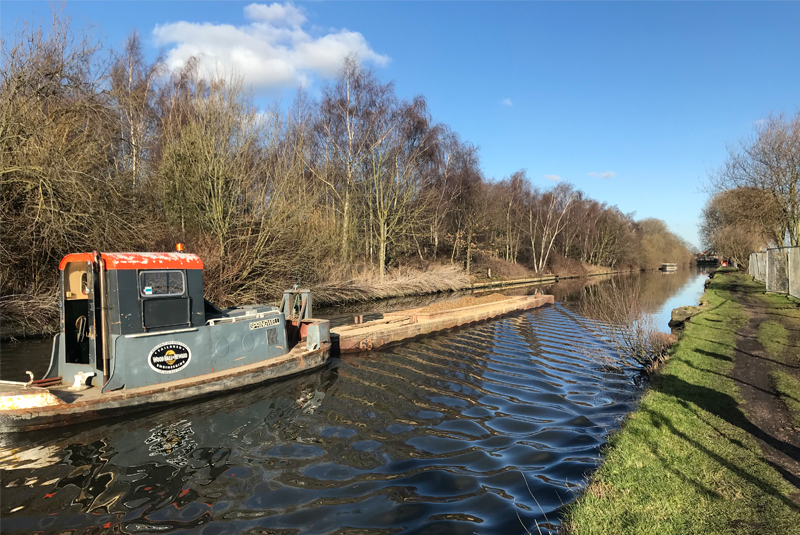 Between January and August 2018, CBOA member Wood Hall and Heward Ltd (WHH) operated a push tug and three hoppers carrying a range of aggregates from 20 mm stone to dust, top soil, sand & soil etc. to the Southall Gas Works construction site. This was being loaded at Bulls Bridge wharf by the Toll House – part of Conway's yard and unloaded a short distance along the Paddington Arm over the towpath at Southall Waterside straight into the St James's site near the concrete batching plant. The site provided banksmen on the towpath to manage safety with pedestrians and cyclists on the towpath while the machines were unloading. WHH were loading approx 60 tonnes per hopper, except through the dry spell when they were down to about 45 – 50 tonnes per barge with lower water level on the long length from Cowley on the Grand Union Main Line through to Camden locks on the Regents Canal. They tended to work a 6 day week so if all went well they could manage 8 - 10 barge loads a day; one day tug skipper Mick delivered 11 barge loads. So the delivery rate was approximately 3000 tonnes per week. Impressive for a small waterway, and also for the capability of Wood, Hall land Heward Ltd.
Loading & unloading was done by 360 excavators are both ends. They used 2 machines at the unloading ending to keep up with the loading machine so we did not have to wait for a hopper to be unloaded. Most of the aggregate was used by the onsite concrete batching plant. Some of the materials went direct to contractors on site carrying out ground works etc. Road access to the Southall site is along a residential road, Beaconsfield Rd, at the Station end of Southall and the planners put a restriction on St James site as to the number of lorry movements that they can have in any day on Beaconsfield Road. There is a new road access being built across the canal from the Hayes end. So until that is complete the barge transport was much needed and provided additional capacity over and above the number of daily allowable lorry movements. The onsite operations personnel were impressed when WHH delivered 660 tonnes of aggregate in one day (this represents 33 twenty tonne lorry loads i.e. – 66 movements from the local roads). WHH originally proposed that the construction company might look at opening up one of the 3 canal docks that used to exist in the gasworks but that was unfortunately not followed up. If it had, future canal delivery would have also been easier to achieve, together with the incentive of having the facility for it and with pedestrian safety and site security built in. Perhaps this is something to be gleaned for similar future works of this nature and how the planners should be persuaded to have this included within the planning consent. The first of 450,000 tonnes of aggregate began moving by barge in 2003 as part of a new initiative to move sand and gravel (so avoiding using already congested roads) from a gravel pit to a canalside concrete making plant owned by Hanson, the international construction materials group at Stockley Park, near West Drayton, West London. Up to 60,000 tonnes a year was moved by a fleet of four craft. The boats move the cargo about 5 miles and sometimes do two journeys a day, avoiding up to 6,000 lorry movements each year. Two new barges were built, especially for this trade, to the maximum dimensions of local locks to maximize the freight carrying capacity. About 70 tonnes - over three lorry loads – were taken in each barge. Extensive dredging had been carried out so that the barges could load to over 4ft 3" draft. The barge holds were fitted with an inner "skin" with sloping sides, allowing the grab to unload more effectively the last few tonnes. Loading a barge at Denham took about only 10 minutes, the material being loaded at approximately a tonne every 10 seconds. Communication with the pit staff was via mobile phone. The barge captain started the conveyor and saw the tonnage being loaded on the wharf electronic display panel while he controlled the loading of his barge. Weighing was achieved dynamically at the start of the conveyor at the pit end. The total is displayed at both pit and wharf, registered by the wharf control unit and automatically printed when the process was complete. The barge captain then took the printed ticket with him to Hanson, leaving a copy for Harleyford Aggregates, the pit owners. At the destination wharf, the barge captain operated a crawler mounted grab to unload the stone or sand into nearby storage bins. The stone was later picked up from the wharf bin by a four wheeled loader whose bucket took about 6 tonnes at a time and fed into the concrete plant hopper next to the wharf. The sand was taken from the wharf bin by the loader to the B320 "Black Top" plant to make road surfacing material. The plant is in operation 24/7 so the wharf bins could be low when the first barge arrived in the morning. Two types of aggregate were carried, 5-20mm quartz stone and sharp sand. The as dug material was washed, graded and if necessary crushed after extraction, with the smaller grades of stone being used elsewhere. 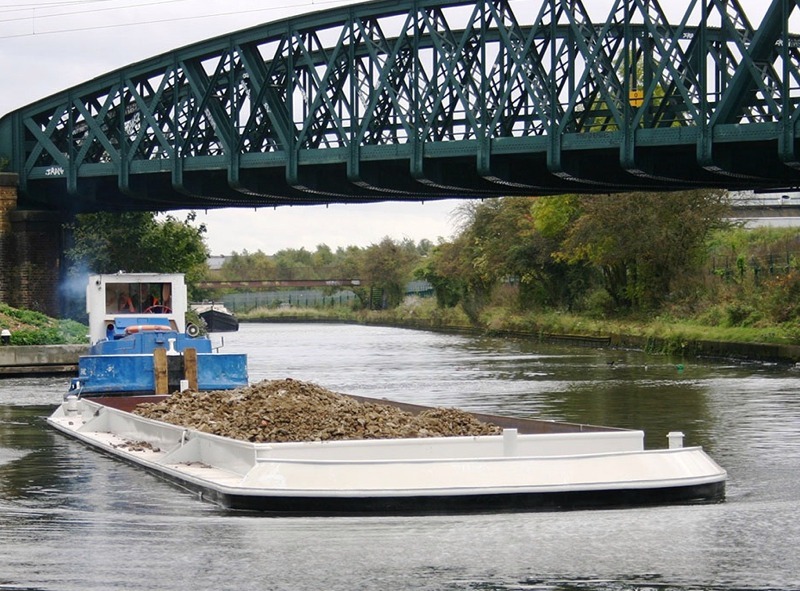 The capital investment included the construction of two purpose built barges, a conveyor belt to move the aggregate 1400ft from Harleyford's Lea Pit near Denham to the canal side, loading and unloading wharves and a long reach grab to unload the barges at Hanson's depot. Help with some of the capital funding came from a Freight Facilities Grant from the Government and British Waterways (now The canal & River Trust) secured other funding to help with the unloading facilities at Stockley Park. Sometimes additional vessels were used to increase the tonnage delivered; tugs and pans, other barge types and narrow boats. Harleyford Aggregates planned to extend the excavation area to a further 60,000 tonnes of aggregate, extending the life of the canal carrying facility. Once excavated, the area was be backfilled using inert materials be moved by barge too. 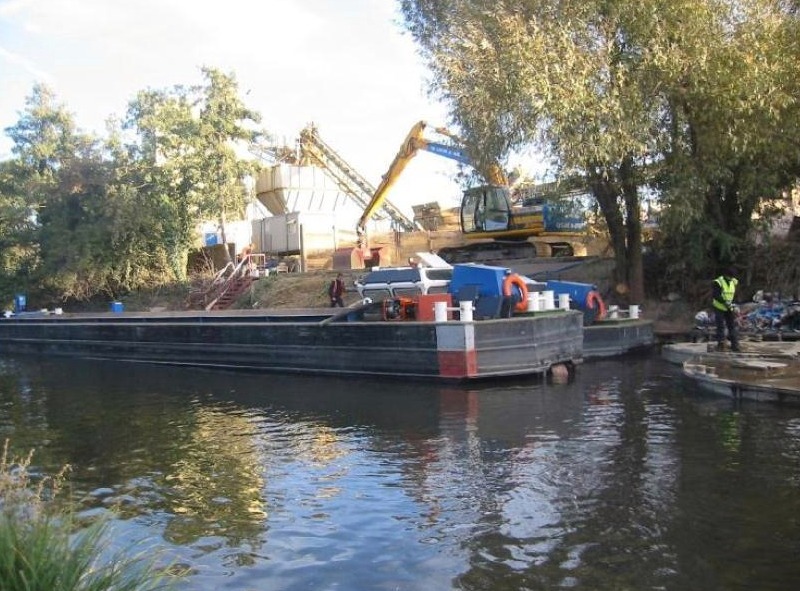 In the event at the end of the initial contract in 2011 Hanson decided to source ‘in house’ as spare material was available, and the quarry extension and inert material options were not taken up for various reasons unconnected with use of the canal. Hanson also supplies a variety of other aggregates from the Stockley Park depot. They regularly receive hundreds of tonnes of other aggregate by rail into their own sidings, off the Great Western line. Other possibilities have been discussed for canal transport ventures to or from their depot in the future. Although this traffic has now ceased it demonstrates that the smaller waterways can be utilised for successful large scale movement of freight when the circumstances are right. There are some 2000 miles of canals in England and Wales, and there are a lot of people living and working on and around them. Many canal side properties are still reliant upon solid fuel for heating, and in some cases, cooking too. There are also increasing numbers of people living aboard their boats, and many of these also use solid fuels and need diesel deliveries. Various narrowboat operators have tapped into this market, having developed a regular trade delivering both wholesale and retail solid fuels, diesel and other products. One has a loading wharf in the West Midlands and travels to places as far afield as Northwich, Gloucester and Oxford. Others operate in Cheshire, Northamptonshire, the Thames Valley and the London and South East. The trade is cost effective as around 19 tonnes of pre-ordered fuel is carried per boat per trip. Many canal side properties have limited, and in some cases, no road access, which makes this service invaluable. Deliveries of large or awkward domestic items can also be accommodated, including such items as a new Rayburn cooker. Narrow boats were also used as part of a fleet of boats that moves washed and sorted sand and gravel on the lower Grand Union Canal from gravel pits at Denham (Bucks) to Hanson’s concrete making plant at West Drayton in west London; further information is given in one of the case studies. Narrowboats are sometimes seen on other duties, for example, carrying stone for tow-path works, and carrying building materials to properties where road access is a problem. 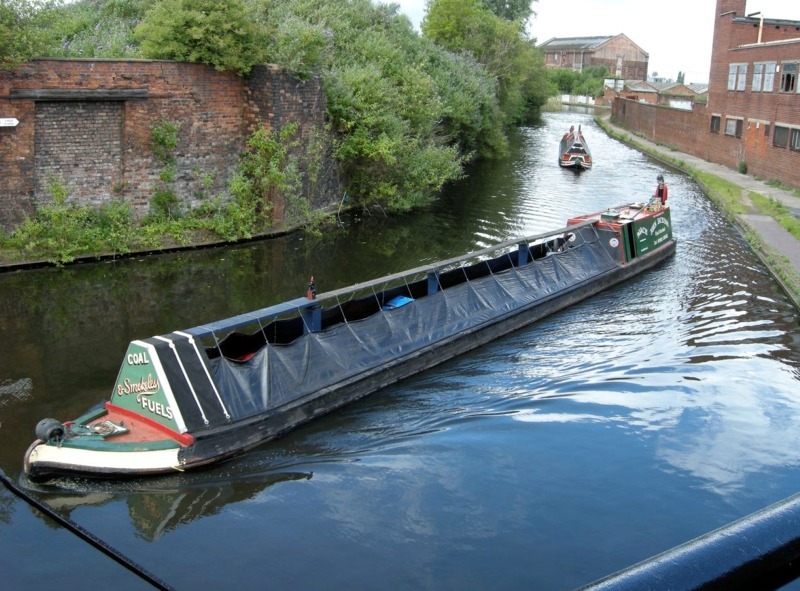 The average narrowboat is capable of carrying around 20 tonnes on a draught of about three feet. Leisure boat users benefit from the movement of loaded narrow boats as they help to keep the channel clear. They also provide a colourful example of Britain’s canal heritage. From time to time abnormal or unusual loads are transported on the smaller canals. This is usually because the normal road access is not big enough for a particular load or because a specific site has no longer got road access due to building developments. Recently an 18m by 4m by 2m food processing cabinet was moved for the New Covent Garden Food Company into their premises in Willesden by barge. The food processing equipment was delivered by road from Germany to Powerday’s wharf in Willesden. From there the equipment was loaded onto a motor barge fitted with rails and wheels so the equipment could be unloaded directly into the NCGF Co premises from the canal side. When the motor barge was moored up alongside the New Covent Garden Food Companies premises rails were run ashore so the equipment could be moved off the barge and down the rails into the NCGF Companies food processing plant. The various parts of the equipment were then assembled on site to rebuild the full 18m long piece of equipment. In another example a hydraulically operated lift bridge that had been installed in Paddington before the recent developments took place needed to be removed for servicing. The only access to this bridge was from the canal. Using a plant pontoon, a lifting turntable allowed the bridge to be lifted up off its fixings and to be rotated round 90 degrees and lowered into the pontoon. It was then moved along the canal to an access point for onward transport by road. 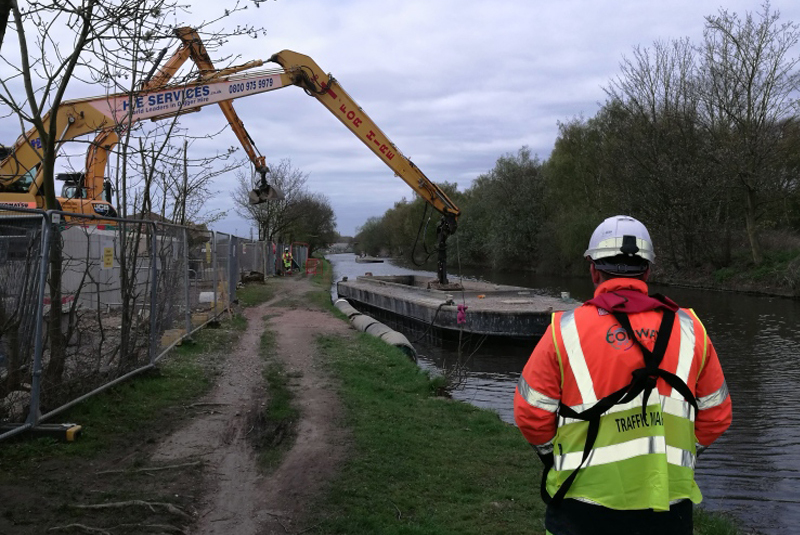 The construction industry has been making increasing use of the inland waterways networks to support the various activities involved in developing waterside sites. Recently tugs and barges removed around 500 tonnes of excavated material per day from a development site in east London next to the Regent’s Canal. By using a combination of road and water transport, the developer was able to reduce the number of lorries visiting the site each day by half with a corresponding reduction in road congestion and vehicle noise around a heavily residential area. Over a period of 3 months approx. 30,000 tonnes was moved from the site. In west London about 5,000 tonnes of excavated material from the initial piling process was recently removed from a waterside development site directly to Powerday’s reprocessing facility at Old Oak Wharf in Willesden. In this case the developer avoided any lorry movements in and out of his site onto the busy Harrow Road during the piling phase. Improved workflow: A constant flow of barges makes better use of on-site excavators than the stop/start process of servicing an intermittent flow of lorries caught up in traffic. Space saving: Better use of limited space by reducing the number of lorries entering and leaving the site. Each barge can move a minimum of 3 to 4 lorry loads at a time making water transport an efficient option.